This post was kindly written by Cedar (SDN username: Study4D8T) on how to prepare for the DAT the right way and achieve a high score. Even more valuable, he describes the mentality that can cause you to end up with a low score. I strongly recommend reading this post to get an up close look at what it takes to achieve a stellar score in biology. I took DAT past week and I wanted to share my insight as 4th time DAT re-taker. I’m only going to talk about the biology section, as it always seems to be the section students struggle on compared to general chemistry and organic chemistry. 1. Read CliffsAP Biology from cover to cover. Solve the problems at the end of the each chapter. You should have missed no more than 5 per chapter. Print out Bootcamp Bio Notes. Read from cover to cover. While you read, highlight, underline, and even draw your own figures on your notes. Read very carefully. 2. Know that successfully completing 40 practice questions a day is sufficient. But spend time on every question, looking over EVERY word on the question that you are not 100% sure about. Do not focus if you have chosen the correct answer or not. Care only to see if you are familiar with everything on that question. b. Is plasmid circular DNA too? Plasmid and plasma sounds similar, I should not get these two confused. c. What is pili? What are conjugation, transduction, transformation, and how do they differ? Which one involves integration of host DNA strands? What does the word “prelude” means anyway? d. Where are mucous membranes found in our body? Where else can Pili be used to attach to? 3. Actively write down all that you have looked up on a separate notebook or text document. 4. Also read the back of the book explanations to learn additional facts. 5. Watch Khan’s academy videos, and add into your notebook of facts. Video sources will help you approach the topics that you are most afraid to tackle. For me, it was female ovarian cycle, hormones, and cell-mediated immunity, for example. I watched all the relevant videos and solved the questions on that website. 6. You should have gone over the Destroyer once in detail. You feel like you remember nothing. 7. Take DAT Bootcamp tests. After each test, you’d read over the answers, and do the same drill as how you approached the Destroyer: Look up every word and concept from the questions AND answer explanations. I wrote everything I looked up in a separate notebook that I reviewed each day. 8. Go into Prometric center most humbly, take the test, and get a 21. 1. Be sure to ONLY read through your Bio textbook. Highlight a few stuff, and look at figures. It will serve as refresher from what you’ve learned in your intro biology classes, seeing what you already know. 2. Feel good about what you already know and SKIP the parts you don’t understand. For example, I hated female ovarian cycle, hormones, and cell-mediated immunity. So I skipped it, and prayed that it would not show up on my real DAT. I used Kaplan GRE Subject Test: Biology. Do not go over any practice problems. Just read casually, because life is too short to be discouraged by questions that you do not know the answers to. 3. At the end of the DAT preparation, be proud of all the highlights and underlines that you’ve marked on your book. 4. Go into the Prometric center like a boss, take the test, and get a 16 in biology. 1. Read bunch of breakdowns from SDN, and get all pumped up after learning the power of DAT Destroyer, Topscore, DAT Achiever, DAT Qvault, DAT Bootcamp, Khan’s academy, and Bootcamp Bio Notes. You are very excited because you can’t wait to post your own breakdown of AA 25. 2. Read CliffsAP Biology from cover to cover. Solve the problems at the end of the each chapter. You should have missed no more than 5 per chapter. 3. Print out Bootcamp Bio notes. Read from cover to cover. While you read, highlight, underline, and even draw your own figures on your notes. Read very carefully. But do not take any notes or solve any questions. Just read the Bootcamp Bio Notes in detail. 4. After that, you should feel ready to destroy the DAT Destroyer. You go over the questions by reading the question, and selecting the correct answer. If you got it wrong, you flip over to the answer page and read. Just read the answer, nod your head, and move on to the next question. You are excited every time you see the question with answer choice “All of the Above”! These questions are dead giveaways and you don’t have to go over the answers, obviously, because you got it right. You tell yourself ‘Guessing is an important skill in DAT. ‘ Yay, one less question to wrestle with, right? 8. Go into Prometric center like a boss, take the test, and get a 17 in biology. Check to see if you fall into any one of these! 1. Are you afraid of learning certain concepts because it’s hard to understand or remember? Are you avoiding these areas? Are you hoping that you would get lucky and these topics would not show up on the real DAT? 2. Are you reading textbook/prep books passively? Does your reading consist only of highlighting/underlining? Are you not looking up other sources to look at it from different angle? 3. Are you completing the Destroyer by merely trying to select correct answers? 4. Are you making a schedule that is realistic? Are you falling behind often in your schedule? 5. Do you dream of getting a 25 , but you find yourself watching TV or on Facebook or SDN, more than an hour a day? 6. 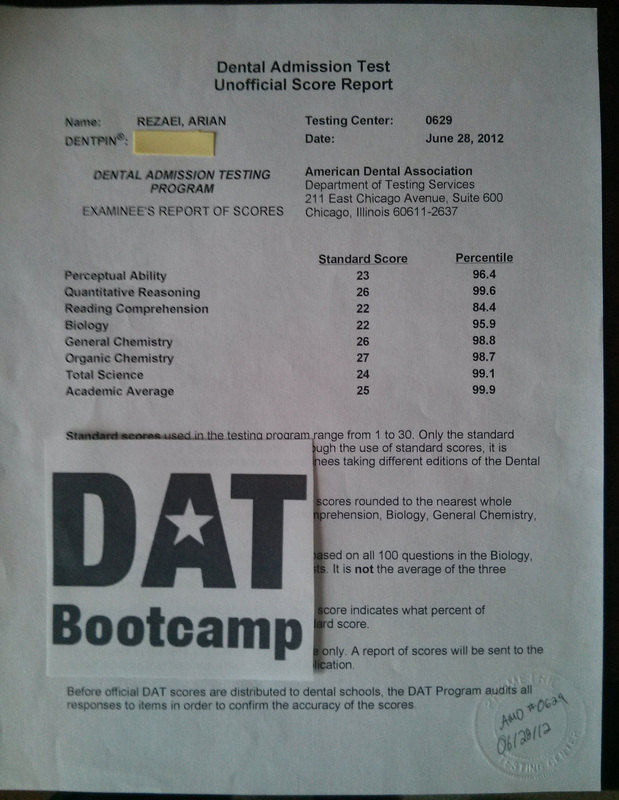 Are you predicting your score by adding a point to your DAT Bootcamp score, ADA 2009, Qvault, or Topscore? Not everyone falls into that trend, unfortunately. Assess your methods of acquiring knowledge, instead of focusing on your estimated scores. We all make the same mistakes again and again, right? I was a bit ashamed to write about my long journey with the DAT, having to take it 4 times, crappy GPA, non-traditional, and having to study close to 5 months just to reach a 21 in biology. But I’ve shared all this to connect with some of those who are reading this now. I know only a SMALL number of the SDN community has a superb DAT success story. Congratulations. But to those who are not able to write your own breakdown because it’s sub 20, don’t be discouraged. If you had to study 5 months, don’t be discouraged. If you had to retake 3 times, don’t be discouraged. If you have GPA lower than 3.0, be a little concerned. I have been there, and done it all. If you are preparing for the test right now, be honest with yourself and see if you are doing what I have done above. And if you are doing what I am doing, you can, perhaps, expect corresponding scores. Just answering the questions and skimming the material does not guarantee a good score. It’s HOW you approach the resources and asking yourself questions to actively learn that will improve your score.